The Thursday issue of the Norwescon 40 daily 'zine. Welcome to Norwescon 40! It’s hard to believe it’s been 40 amazing years already. As usual, we have a huge selection of panels and events to entertain and educate you throughout the long weekend. Our theme this year is Over the Hills and Far Away (which is where some of you came from) and we’re very glad you could make it. Without you, there would be no convention! Please have a fun, safe, and relaxing time while you’re here with us. Sometimes events are moved, cancelled, or added during the convention. We will try to keep you informed of changes as they occur, but the best way to stay up-to-date is to download the Guidebook app at https://guidebook.com/g/NWC40 It’s easy to use and allows you to set reminders for upcoming events! There are tons of things to learn this year with our new workshop series that includes several writing and publishing workshops, Glass Fusing, Victorian Ribbon Flowers, and Make Your Own Buttons. Advance sign- up is required, so go to Cascade 1 and add your name! Keith and Alan are back—with twice the fun! Get to bed early tonight because Movie Previews start first thing Friday morning. Keith and Alan are back and ready to bring the latest from Hollywood straight to your eye/ earballs with TWO shows: early Friday at 10:00 a.m. in Grand 3 and Noon Sunday in Evergreen 1&2. There is also an after-party meetup at 1:00 p.m. Friday in the Volunteer’s Lounge for things they didn’t have time for in the main Friday show. So much genre stuff to talk about: movies, TV, theme parks, the whole gamut. Get a good night’s sleep and BE THERE! ...and his strange short tunes with very talllll tales. All in super-airy high acoustics GRAND 3! The official hashtag for this year is #nwc40—if you’re posting text, photos or videos to social media just about anywhere (Twitter, In- stagram, Facebook, Tumblr, YouTube, etc. ), please use the #nwc40 hashtag! We’ll be doing our best to track those posts wherever they pop up, both during the convention to see what all of you are enjoying, and afterwards for our annual post-con roundup of con experience posts. We’ll be peeking at some of the other likely used tags as well (#Norwescon, #norwescon40, and so on) but #nwc40 is the one most likely to get your post noticed. Just go to www.guidebook.com and click on FIND A GUIDE then type Norwescon in the box. Select the Norwescon 40 icon and then scroll down to the AVAILABLE ON THESE PLATFORMS section. Then click WEB! Not exactly easy, but it’s there. 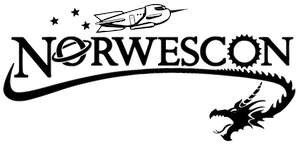 As the weekend unfolds we know you’ll see things about Norwescon you like, don’t like, or want to suggest. Don’t keep it in! Just fill out one of our Comments Cards (there is one in your Regis- tration Packet). Bring it to the Information Desk or the Con Office, or check the back of the card for other ways to contact us. It is with great sadness that we impart the news that Pamela Rapiñan (Raven Sunshine), who has provided massage services at Norwescon for many years, passed away recently. Although her physical presence is no longer here, her bright spirit lives on in the hearts and memories of those who knew her. Cheryl Dyson, “Norwescon 40 Daily Zine (Thursday),” Norwescon History, accessed April 19, 2019, http://history.norwescon.org/items/show/373.